You can now add a "fixed" trip to the SG Calendar. You add a fixed trip by dragging any trip (bookmarked or not) onto the SG Calendar when the [Create Schedules] command button is shown and enabled. BB will recognize and label that trip as a "Fixed" Trip. It will remain on your SG Calendar until you remove it. 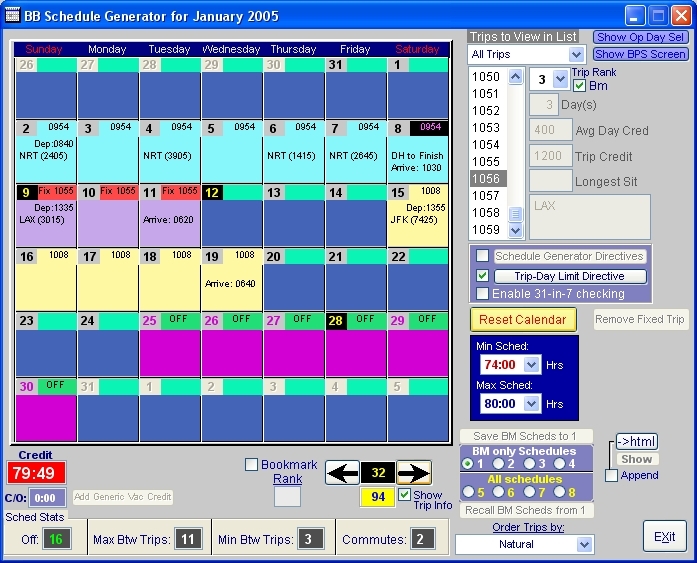 When you build schedules and the SG Calendar contains a "fixed" trip, all possible schedules will be created from "bookmarked" trips that accommodate the "fixed" trip. The "trip-day limit" directive has no effect on the "fixed" trip, but does still limit all other trips to the directive limit when BB builds schedules. 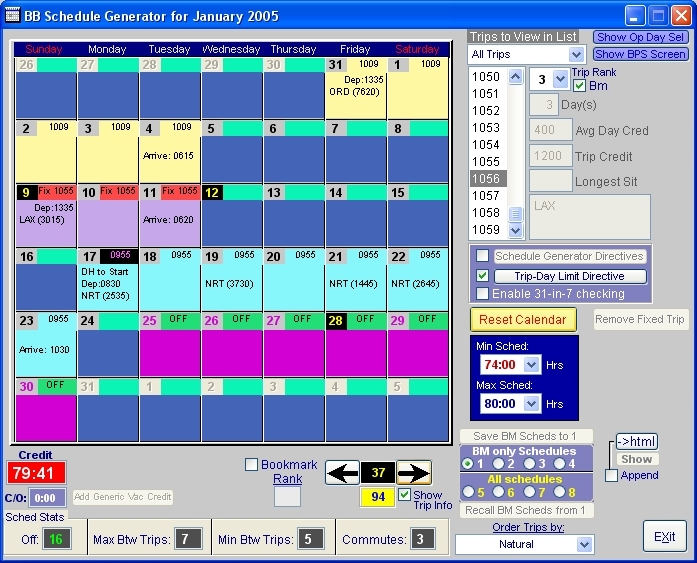 Here is a screen shot after trip 1055 was dragged onto the SG Calendar as a "fixed" trip. You can remove a "fixed" trip only using the [Remove Fixed Trip] Command button. That button is normally labeled [Create New Blank], but is relabled when you add a "fixed" trip to your SG Calendar. After you remove the "fixed" trip, BB will revert to "normal" operation. BB allows only one fixed trip on the SG Calendar. BB won't allow you to drag another. 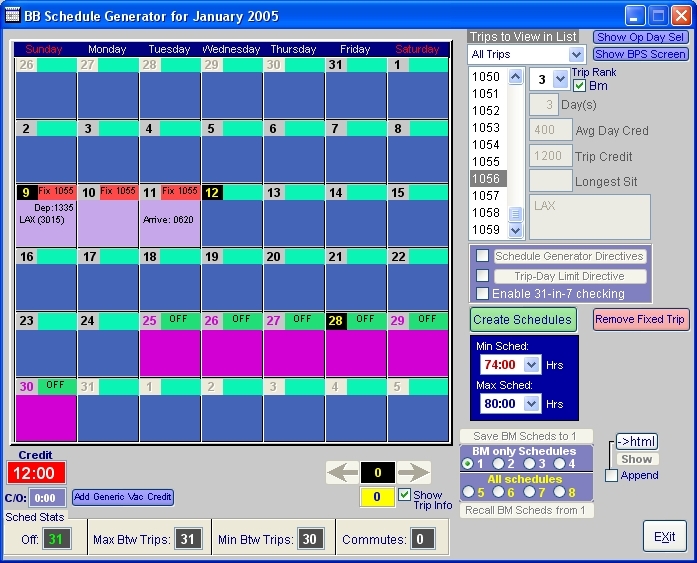 Here is a screen shot after BB generated schedules with the "fixed" trip. As you can see, the schedules are built "around" the "fixed" trip. BB will now label trips on the SG Calendar that begin and end with a deadhead. The shading is also different so it's easy to see. In the screen shot above, you can see the labeling on the last day of trip 0954. Here is another screen shot showing labeling for trip 0955 that begins with a deadhead.